Heat 1 tablespoon extra virgin coconut oil in a skillet over medium heat, and cook the chicken until juices run clear. Puree the roasted red peppers in a blender or food processor until smooth. 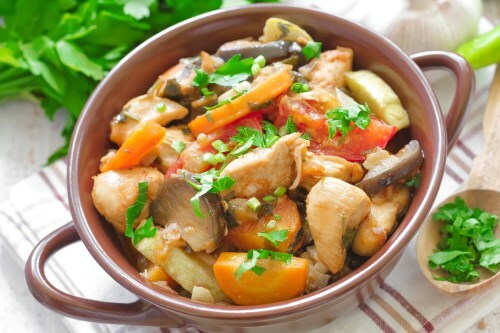 In the prepared casserole dish, mix the cooked chicken, roasted red peppers, tomatoes, mushrooms, onion, and garlic. Season with salt and pepper. Drizzle with remaining 1 tablespoon oil, and top with mozzarella cheese.